Films based on “true” stories are interesting to review as they will inevitably distort situations in the name of drama. I personally do not mind if a film compresses times, characters and incidents as I am interested firstly in my emotional response to the story and characters more than historical authenticity. If I want accuracy I’ll rely on Wikipedia. Yet, as films based on ‘real’ events go The Imitation Game (2014) is a creditable distillation of the WWII code-breaking heroics as well as being a high class theatrical tragedy in cinematic form. 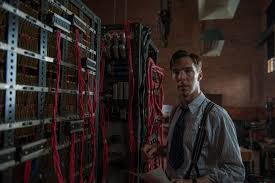 Having said that while the film acts as an excellent tribute to the genius of Alan Turing (phenomenal Benedict Cumberbatch), the work of others in the field such as the Polish code-breakers, Tommy Flowers and many others must also be recognised. But perhaps that is for another film altogether. I didn’t know much about main protagonist Alan Turing prior to seeing this movie but having done some basic research one soon realises what a great British hero he was in terms of cracking the Nazi Enigma codes. Moreover, his incredible mind also contributed in some way to the invention of what you are reading this very review on right now. No, not http://www.wordpress.com but the actual computer itself. The fact that one of humanity’s greatest minds was treated so badly because of his homosexuality is a genuine war crime. 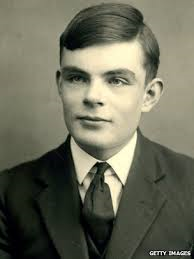 It’s also a massive indictment AGAINST the Government and the Official Secrets Act that Turing is only just being truly recognised for his outstanding work in the last few years. Indeed, one of the films main strengths — not forgetting Andrew Hodges’ book on which it is based — in bringing Turing’s story to the screen is it acts as a thrilling monument to a man so cruelly destroyed by an intolerant 1950s society. 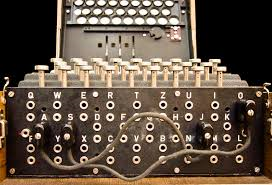 The narrative switches between Turing’s life pre-war, post-war and in-between. Graham Moore’s screenplay is deftly written and well-paced; both personable and witty. In terms of genre we are in biography and war film territories with a sprinkling of espionage and suspense thrown in. The code-cracking team at Bletchley Park are a kind of super-intelligent version of Marvel’s Avengers and include a handsome cast supporting Cumberbatch including: Matthew Goode (the next James Bond I reckon), always reliable Mark Strong and a commendable turn from Keira Knightley. Firstly the team clashes with the prickly and arrogant Turing. Then, of course, over time they come to respect him. Meanwhile, idiosyncratic Turing finds his main ally in Joan Clarke (Knightley) as their “romance” becomes the heartbeat of the piece amidst the manipulation of machines. Both hearts and minds are drawn to each other and the two get engaged. But Turing’s sexuality proves an obstacle to the marriage and there’s a wonderful scene which reflects this; beautifully played by Cumberbatch and Knightley and echoes — albeit more seriously — the classic “No one’s perfect” end-scene from Some Like It Hot (1959). There is so much heartache in the character of Turing. The flashbacks to Turing’s school years when he was bullied and suffered personal loss garners further pathos. Moreover, the “peas and carrots” scene alludes to the possibility of Turing having Asperger’s or similar high-functioning autism. And in Benedict Cumberbatch we have an actor who imbues Turing with a grandiose pain which I found genuinely moving. Here’s is an actor — who while cornering the market on misfit geniuses — once again shows terrific range and surely he will be nominated come Awards ceremony time. This is a tremendous drama directed by Morten Tyldum which is arguably more televisual than filmic. Indeed, it reminded of those amazing BBC Play For Today productions I grew up watching when a young boy. It works mainly as a fine biopic of an incredible man so cruelly persecuted for just being born slightly different. Yet it is also has touching romance and high drama as shown when having cracked the Enigma the team face the agony of having to hide the fact as a strategy to win the war. Ultimately, I left the cinema uplifted by the work these amazing code-breakers did and but also with anger in my heart; anger at the damned British Government for not rewarding Alan Turing for his miraculous contribution to the war effort. He deserved so much more.